We walk past a small booth at the 2014 World Maker Faire, and a young boy, perhaps eight or nine years old, jumps out to get our attention. He is so excited we can barely understand what he is saying. He wants us to see his sneakers – adorned with an array of LEDs giving a high-energy light show that would make any grade-schooler envious. He explains that he programmed the lights himself. He is ecstatic, and his enthusiasm radiates into the crowd. “Can I sign you up? Can I sign you up?” He pulls up a registration form on a laptop computer. We have no idea what he wants us to sign up for. A look inside the sneakers reveals an Arduino board with its obligatory Atmel AVR microcontroller. Sitting on the table nearby is another laptop – running a kid-friendly drag-and-drop programming interface that allows kids to write code to create their own shoe-wear lighting spectacular. You want blinky shoes? You gotta program them first. It’s gonna be FUN! Technology has made an odd and interesting circle. Over time, advancing the state of the art has required professional engineers to gradually become more and more specialized. Getting a modern chip designed and manufactured on a leading-edge semiconductor process requires literally hundreds of specialists in various disciplines – from process and materials science to analog and digital design, software engineering, thermal analysis, electronic design automation, verification and testing – the list goes on and on. And, each of those disciplines subdivides into smaller, tighter specialties. Most of these specialties are career-long studies, requiring decades of disciplined work to gain the required level of expertise and experience. We could not create something even as technologically pedestrian as an Atmel AVR microcontroller (the brains inside Arduino boards) without an enormous, well-funded industrial ecosystem and the cooperation of innumerable experts. Dozens of companies, billions of dollars of semiconductor fabs, and hundreds of engineers all collaborate for years, and the thing that pops out of the end of this astounding is something like an open-source Arduino board – destined to welcome grade-schoolers to the art and science of programming and electronic control. The exploding “maker movement” has its roots in artisan culture. From home-baked bread to do-it-yourself furniture to quilting bees, the idea of making things for ourselves rather than buying them is a centuries-old tradition, interrupted only briefly by our current box-store, pre-packaged, choose-a-base-model-and-your-options brand of consumerism. The maker river is also fed by the hacker stream – where just about anything is fair game for modifying, re-purposing, and improving beyond what the original designers envisioned. But, Maker Faire is not a quilting bee. 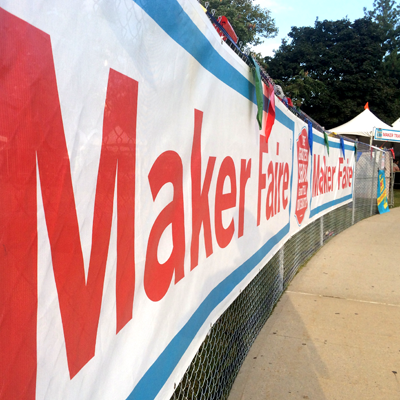 What separates Maker Faire and the maker movement from artisanal movements of the past? We talked with Dale Dougherty – president and CEO of Maker Media and co-founder of Maker Faire. He pointed out that one key enabler is today’s ready availability of low-cost high-tech building blocks. If your basic building blocks are squares of fabric, the range of things you can create is limited. When you expand your repertoire to include things like microcontroller boards, 3D printers, and the full gamut of modern technology, tools, and techniques, the universe of things you can create expands exponentially. This re-connection to the building blocks of technology is where the realm of makers begins. “It’s cheaper and easier than it ever was,” Dougherty explains. Strolling around and checking out the show’s displays – the work of more than a thousand makers – one can’t help being inspired. The energy and enthusiasm were palpable – both in those showing their creations and in the crowd. It was probably a rare attendee who didn’t feel the overwhelming urge to run home, order an Arduino board, 3D printer, or robot kit, and start whipping together a quadcopter or intelligent coffee machine. That inspiration could be seen in all age groups, but it was particularly visible in the younger attendees. Dougherty describes one of the movement’s biggest challenges as “the Monday morning problem,” where people who have attended a Maker Faire and found themselves bursting with excitement get back to their normal life/home/school environment, and they don’t know where or how to get started. Most folks don’t have the resources, space, or time to run out and pick up a load of the latest tools and materials to start their big creative project. For kids, the problem is even worse, of course. One way the “Monday morning problem” is being addressed is with Maker Spaces – facilities set up specifically for makers to meet and make. Many of the spaces have resources like tools, equipment, supplies, and workspace. They also come equipped with something even more critical – peer mentors. Dougherty explains that such spaces are critical in establishing the social element, the sense of community and sharing of ideas that are essential to the maker movement. The atmosphere of the show is casual, fun, and almost carnival-like. Attendees are generally encouraged to touch and interact with the creations, and in some cases they have the opportunity to jump right in and get their hands dirty. Overcoming fear, Dougherty explains, is especially important. Too often people block themselves from their dreams because they don’t think they are capable of doing something. “We like things that are challenging,” Dougherty observes. “At the heart of it is what happens to people.” He tells us that while the maker movement is about changing the relationship between people and technology, an unspoken part is about getting people to try things they didn’t know they could do. There are stations at Maker Faire where you can, for example, learn to solder. Dougherty is particularly proud of that one. He asks where else we could go and see a line of hundreds of people queued up – waiting for the chance to pick up a soldering iron and stick some stuff to a circuit board. The festive vibe of the show is further enhanced by roving spectacles like giant multi-person cycle-powered alligators, enormous robotic giraffes, and other fantastic conveyances worthy of Burning Man, each belting out electronic music as they wander the streets and alleys of the faire – attended to by colorfully-dressed characters who look like they just dropped out of the carnival themselves. Major spectacle main-stage shows like the gigantic life-size mousetrap game, the internet-famous Mentos and Diet Coke dudes delivering their choreographed Coke-geiser chaos, and the “Game of Drones” aerial quadcopter combat certainly further contribute to the energy of celebration. Dougherty pointed out the vast difference between “push” and “pull” in education – where students learn much more when they are driven by their natural curiosity – pulling in the required knowledge and skills in order to achieve their goals, rather than being force-fed information for which they have no context. Dougherty is right. If we can stimulate curiosity with a desire to create – to design and build things – students will learn. They will be motivated and inspired to explore new disciplines and acquire new understanding, at a rate and with an energy that far exceeds what we get by shoving a textbook in their faces and threatening them with a quiz. But, with enrollment and interest in our engineering schools on the decline and interest in technology careers lagging in recent years, the maker movement brings a bright new dawn to the future of engineering. It takes only a quick stroll down the main street of Maker Faire to get a feel for the vibrant, creative, and intelligent individuals – the kids of today who will become the engineers of tomorrow. With that light comes a brighter, more energetic culture as well. Making gets kids excited, and it takes only a spark of inspiration at a young age to bend an entire future career in a positive direction. Major technology companies like Atmel, ARM, Intel, TI, LG, Microsoft, and others have wisely noted the importance of the maker movement and have decided to join the party. What’s less clear to them, apparently, is how exactly to go about that. These companies, Doughtery explains, are not historically customer-facing. They traditionally are business-to-business behemoths – selling their wares to sophisticated industrial customers. It’s clear to us, in talking with each of them, that they haven’t quite yet got the hang of engaging the curious middle-schooler who wants to know the difference between Raspberry Pi and Beaglebone. They’re headed in the right direction, though, by dropping the pretentious corporate facade we normally find them wearing at other events in favor of a more approachable, friendly, engaging attitude. “This doesn’t look like their CES booth,” Dougherty observes. The makers of today could well end up being the entrepreneurs of tomorrow, however. Kickstarter and other crowd-funding endeavors were highly visible, with numerous projects on display attesting to the success of this new financing phenomenon. The message seemed clear: explore your creativity, make something you’re passionate about, find some backing, and send your dreams out into the world. It’s one of the most inspiring messages we can imagine, and it clearly wasn’t lost on the average Maker Faire attendee. This was the 5th annual Maker Faire in New York City. It was also the 50th anniversary of the 1964 World’s Fair at the same site. The first Maker Faire was in the San Francisco Bay area in 2007. There were 100 Maker Faires last year, with 65 of those in North America. This year there will be 135 Maker Faires. The largest Maker Faire outside the US last year was in Rome, with an estimated attendance of 65,000 people. The goal of the Faire is to create conversations between makers, and to create and inspire more makers.